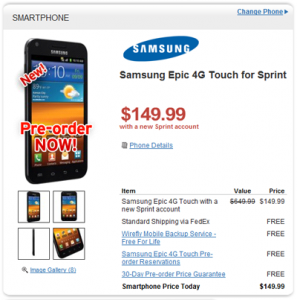 Looking to get your hands on the Galaxy S II series Epic 4G Touch from Sprint? We can’t blame you, that thing is a beast. The phone goes on sale September 16th for $199.99 if you decide to go through the carrier. If you’re one of those people who doesn’t care where it comes from as long as it’s legit and lower-priced, we recommend you check out Wirefly. Not only can you reserve your spot in line, but you can also shave a cool $50 off the price, grabbing it for $149.99.